François de Visscher (FdV): Why is it more attractive to be a direct investor as opposed to investing in private equity funds? Paul Carbone (PC): Well, I think there are several reasons. First of all, many families built their wealth by owning and building companies, so there’s a natural inclination and comfort with being a direct investor. At the same time, over time, families have grown uncomfortable with the traditional private equity (PE) business model. The fee structure is seen as high and I think it makes people anxious about alignment of interest as well. The traditional PE business model also forces general partners to sell their businesses quickly over shorter hold periods, resulting in higher relative transaction costs/tax burdens and possibly truncating upside opportunity. It’s a philosophy that emphasizes internal rate of return (IRR) as opposed to money multiple, resulting in another issue for many families with the traditional model. What we believe is that, in addition to addressing these issues, by being a direct investor we can generate higher returns and at the same time manage risks more aggressively and appropriately. We believe that by being a direct investor we can invest only in the sectors we understand and like. We have teams in place that can directly work with the companies to create strategies that generate higher returns and, at the same time, manage our downside risk better. So when you put this all together, we think this is the better business model for us. Now let me quickly add this is not a business model for all families. You have to have the right minimum amount of capital to make the effort worthwhile. You have to have the right strategy and objectives, and you have to have the right team. So direct investment is not a strategy for all families, but it is an excellent option for the families that can put together the strategy, team, and capital needed to generate higher returns, better manage risks and avoid some of the issues inherent in the traditional model. FdV: Why are family businesses so attractive for to you to partner with? PC: Given our family pedigree, we bring a family perspective and understanding of family businesses. So, we know how to build value with those sorts of companies. We understand the issues, the risks, the opportunities, and the perspectives that families have in building businesses. At the same time, families are interested in preserving their legacy and want to make sure there’s a good steward of the companies that they’ve built. We can bring that solution to the family and its business. We can do things, again, as I was mentioning before, differently than traditional private equity so there’s a comfort level for families interested in partnering with us — a mutual respect and an understanding that I think form the basis of a good partnership. FdV: What are some of the challenges you see when you are looking at investing in family businesses? PC: Because we bring a family perspective, we understand the vagaries of family business — and because of our flexible capital we are comfortable dealing with those vagaries. 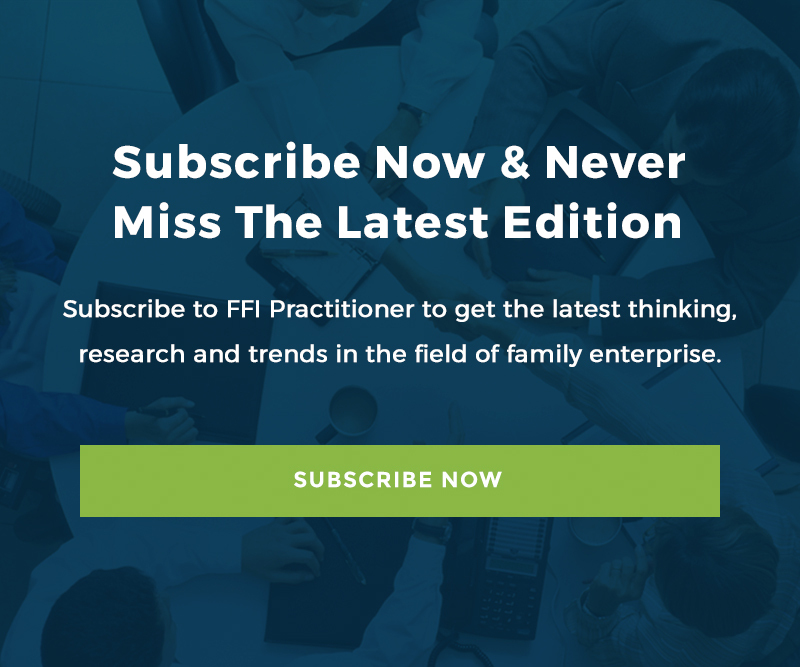 The issues you find in the family business can be innumerable and complex, especially around family dynamics, e.g., are some family members active in running the business and some not? Are there family differences around how the business is being built? Have they historically been focused on a dividend stream as opposed to reinvesting in the business? With regard to the risk profile, many families have much of their wealth in the one family business asset and little real wealth outside that asset. That situation can impact the family’s perspective on risk taking with regard to how they build the business and grow their wealth. Is the business investing for the future? Is it taking advantage of all appropriate opportunities? Can the business sustain its competitive advantage, grow in the face of changing competition, and continue to attract the right talent? So the complexities are many. But what we find, what appeals to us, is that often there is a great culture in these businesses. There’s a passion for the business. The culture and passion for the business likely have been key reasons why it’s been successful. What we try to do is bring resources, capital, and expertise to the table to help take the business to the next level. In some ways we professionalize the business in terms of practices and procedures: bringing new talent to the table to complement the existing team but always preserving the culture, the family perspective, and the passion that the family, senior management and employees have in the business. Again, this is often one of the core competitive advantages a family company has in the marketplace. FdV: How important is the value system in the business and how it works with the Pritzker Group’s value system? PC: It’s critical. The value system of the family is often directly translated into the value system of the company and the management team. We want to be simpatico with the families and business with which we partner in terms of how we each look at the world and how we treat others. Honesty, integrity, loyalty define our value system. We want to partner with people where their value system is important. What’s interesting is that we run across very nice companies where they may not use those three words but our values are effectively the same. They define it differently. They use a different phraseology, but how they operate and how they do their business is just as important to them as winning in the marketplace. So we find a commonality of values is critical to our partnership with a family business. It’s an essential component of how we operate. FdV: As a long-term family office investor, any advice you can give to the advising and consulting community on how to partner with a family office? PC: One of the key ones that I think is very important for the advisors and consultants is to work with the family to define its objectives for a potential partnership. They then need to prioritize those objectives and recognize that there’s likely going to be some sacrifice in achieving all of them. It’s a multi-variable equation, and you often can’t solve for all the variables. Families understandably want to achieve multiple objectives related to stewardship and legacy, how their employees are treated, continuing community involvement, governance, and the partnership dynamic while still getting the right price for the business. So it’s key to prioritize because what’s going to happen is that it can be hard to get maximum price and find a partner who can provide all these other elements. So if the family really wants maximum price, it should understand the kind of partner they’re going to get and the sacrifice they’re going to have to make. That doesn’t mean that families who value non-price objectives can’t get paid fair and full prices for their businesses. Quite the contrary. In today’s market, buyers have to pay full prices to win the deal. But if a family wants the last nickel out of a transaction, there are going to be sacrifices. It’s likely that the only way for the buyer to achieve that stretch value is to make changes to the company’s community involvement, changes in terms of the employee base, other changes in how the company operates, so I think understanding the tradeoffs and prioritizing objectives is important. The other advice I would give relates to advance preparation. Given that there may be diverse opinions among the family members, all the family members should understand that proper preparation is going to take time, but that taking time will pay dividends once you get into the dialogue with your future partner. For instance, tax planning and understanding is critical. It breaks your heart when you see families who have a flow-through entity, an LLC or an S-corp. And then they partner with a private equity firm which puts what’s called a blocker “C” in the structure which fundamentally destroys value in the company. And one last topic I’ll mention is just a caution: be sure that family members are held accountable to the prioritization of objectives which were agreed to going into a transaction. We’ve seen time and time again as you work through the process of a transaction and the prospect of the cash become more real as you approach the finish line of a transaction, that agendas, relationships, and priorities change. So you may have agreement at the front end but as an adviser, you should be careful and cautious through the course of the transaction because, again, some people’s priorities can change, impacting the family dynamic. Paul Carbone has been managing partner of Pritzker Group Private Capital since 2012. In 2016, he received the Stanley C. Golder Award from the Illinois Venture Capital Association in recognition of his contributions to the state’s private equity industry. He has served as an EY Entrepreneur of the Year national judge for family business for the last two years after spending three years as a regional judge. He will be the keynote presenter at the annual Fellows and GEN Alumni lunch in Chicago in October. Paul can be reached at [email protected]. François de Visscher, FFI Fellow, is founder and president of de Visscher & Co., one of the world’s leading independent financial consulting and investment banking firms for family and closely-held companies. A former FFI president, he is the recipient of the 2003 Richard Beckhard Practice Award and, with his firm, sponsors the de Visscher & Co. Scholarship for the FFI Global Education Network (GEN). He can be reached at [email protected]. Founded by Tony and J.B. Pritzker, the Pritzker Group has three principal investment teams: Private Capital, which acquires and operates leading North America-based companies; Venture Capital, which provides early-stage and growth venture funding to technology companies throughout the United States; and Asset Management, which partners with top-performing investment managers across global public markets.